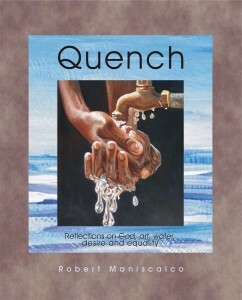 Robert Maniscalco has created a series of paintings , called “The Quench Project” (view the gallery of Quench Paintings), inspired by his vision trip to Haiti in November 2014. He has also written a big, full color book, called Quench, reflections on God, art, water, desire and equality and produced a short documentary, Out of Darkness (view the 17 minute documentary below). The Quench Project explores alternatives to societal ideas about beauty, tragedy and survival. The theme is the resilient nature of humans to rise “out of darkness.” Robert, who is a survivor of child sexual abuse, has dedicated his artistic life to telling the stories and celebrating the triumph of human spirit; specifically, our capacity to turn great adversity into victory. These are stories each of his fellow beings share in common, in our creative journey of survival. Take a look at The Quench Project Budget and Robert’s Arts Infused Charitable Model. Following a successful Kickstarter campaign Robert used the seed money to create/frame his 17 paintings, write his book and make his documentary short (view above). The vision is that The Quench Project will continue to grow and evolve, continuing as an exhibition in a variety of venues in several states, where people from all walks can come see the work in person and become part of the conversation. Robert has taken TQP into churches and community centers, spreading the good mission of light and love. TQP has exhibited at The North Charleston City Gallery, the Kairos Gallery (St Andrews Church-Mt Pleasant), The Greater Flint Arts Council, The Buckham Gallery in Flint, MI, and most recently, at the Coastal Community Foundation, back in Charleston. TQP currently at Fabulon Gallery July 11-August 11, 2017. TQP has also evolved to include recent courtroom sketches for the Dylan Roof Trial, which was completed in January of 2017, in Charleston. This trial and Robert’s sketches were really more about the Emanual 9 and the resiliancy of their survivors than about this misguided, hate-filled young man. TQP is about people overcoming great adversity through actively pursuing faith, hope and love. There is an exhibition of the over 80 trial sketches in the works, as well as a possible book. Please take a moment to read some of Robert’s recent blogs about his experiences and insights from the trial. If you know of a venue that may want to feature an artist talk and/or an exhibition of The Quench Project, or if you are a member of the media interested in featuring Robert and TQP, please contact Robert directly. buy an original painting, AP or a giclee. In the tradition of the Social Realist movement, the project’s goal is to raise awareness for societal issues in Haiti as well as the U.S. Robert doesn’t avoid biting social and political commentary. Water shortages, spirituality, economic inequality and racism are all part of his focus. He has created a body of 17 paintings, mostly of Haitian subjects. 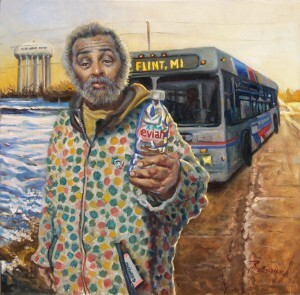 More recently, he has added subjects from Rwanda and Flint, MI. His ongoing series, The Faces of the Lowcountry also are an extension of the mission of TQP. A portion of sales will be donated to Water Mission and to the Bread of Life Orphanage in Jacmel, Haiti.